Do CT Professional Corporations have name restriction requirements? 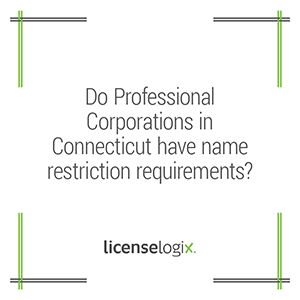 Connecticut laws and regulations do not contain any provision regarding name restrictions or requirements for a Professional Corporation applying for a Certificate of Registration. You should be able to register your firm under any name of your choosing. If you would like LicenseLogix to assist you in registering your firm, please contact us at any time!